Work continues of the former Gallery at Market East in Philadelphia to become Fashion District Philadelphia. Contending that Philadelphia has a retail dearth, Pennsylvania Real Estate Investment Trust chief executive officer Joseph Coradino said Market East will help fill the void and transform the downtown area. 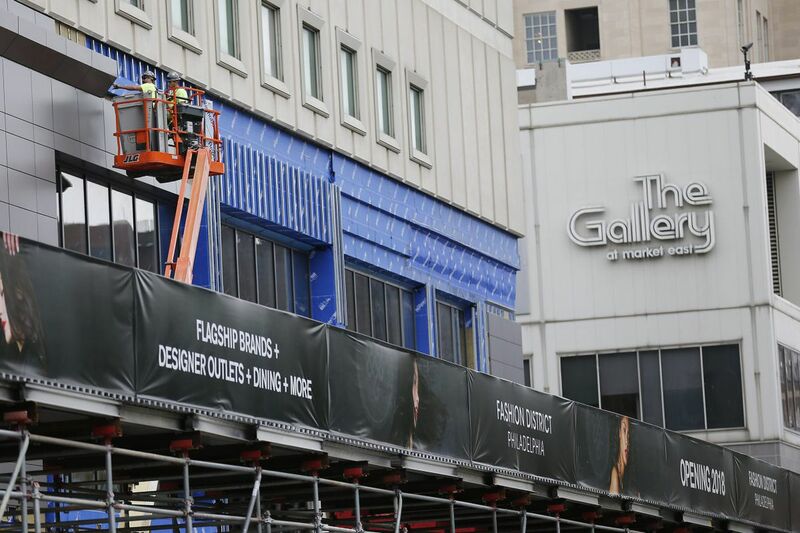 "As you walk down Market Street today it's pretty clear the [old] Gallery is going through a transformation," Coradino said. "The missing link in Philadelphia is retail. We've got great office, great residential, wonderful hotels, fantastic restaurants — you can't keep track of. But from a retail perspective, it ranks pretty far down the list as the sixth largest city in the U.S. We don't compare favorably [in retail] with Kansas City, the 37th largest city in America. You can't buy products that you can get in downtown Kansas City in Philadelphia." From there, Coradino laid out his vision for Fashion District Philadelphia, a sprawling entertainment, dining, and shopping destination that opened its second retailer last Friday, a flagship Burlington store at 833 Market St.
On Tuesday at a presentation at the Union League, Coradino ticked off additional retailers for Fashion District. They include Columbia Sportswear Co., Levi Strauss & Co., Francesca's, and Skechers USA — all of which are "first to Center City retailers," he said. They will join an AMC Theatre and a 30,000-square-foot H&M, the largest in Philadelphia. He also disclosed that the first retail outlet for Wills Eye Hospital will open, selling eyewear with an on-site optometrist. Coradino also described what he called compelling food offerings at Market Eats, a new food cluster with food carts and grab-n-go offerings as well as tables for a quick bite; a pizza venue that will make pizza from scratch from all natural ingredients, a sports bar, bakery, and gourmet burger joint, among others. "The shopping experience in this country has changed and we have to change along with it," Coradino said. "Services have taken a bigger role." Coradino's presentation was moderated by Paul Levy of the Center City District and featured Mark Merlin, a partner at Brickstone Realty, which is redoing the Lits Building, and Dan Killinger, managing director at National Real Estate Development, which is developing the East Market project. A shopper exits Mom’s Organic Market, which opened Sept. 8 at East Market. Mom's Organic Market debuted on Sept. 8 as East Market development's first operating tenant. The grocer is one of the anchors for the project, which takes up the entire block of 1100 Market Street. "The area is very densely populated and the demographics are good," Mom's CEO Scott Nash said of why he took the gamble on opening there. "Most dense urban areas don't have great grocery options, and we wanted to fill that gap in Center City. After opening a little more than two weeks ago, we're really satisfied with how things are going. Sales have been good." In addition to Mom's Organic, other confirmed tenants with signed leases include Iron Hill Brewery, City Fitness, TJ Maxx, AT&T, Federal Donuts, and a Wawa. Another local sit-down restaurant, not yet announced, is also in the mix. Killinger, of Washington-based National Real Estate, said that he pitched the East Market project five years ago and that it falls in line with his company's other "big, transformative projects across the country." "What National is looking for is all here in Philadelphia," Killinger said of the four-acre site that was formerly the Girard Estate. "This is the retail activity with the kind of density that we envisioned. "I believe the days of the Main Street being the focus in the cities has had its day. Now the idea is to build on a smaller scale where you make a place." Paige Jaffe, a first vice president at CBRE Inc. who was involved with several deals at East Market development, said, "The East Market and Brickstone projects started a process to establish large format retail and restaurants along Market Street east of Broad. The Fashion District should only enhance the trends and activity." Jacob Cooper, managing director at MSC Retail, said the fundamentals for East Market to become a retail mecca are there. "While the district may never return to the elegant glory days of Gimbel's, Strawbridge and Clothier, and Lit Brothers, the district is uniquely positioned for a retailing revival … largely because of two reasons: [transit] access and large footprint development opportunities," Cooper said. "The vision has developed and refocused over the years, but as time passes and the retailing world evolves, the vision of East Market is fast coming into focus." Construction work continues at the former Gallery at Market East, which is being transformed into Fashion District Philadelphia.